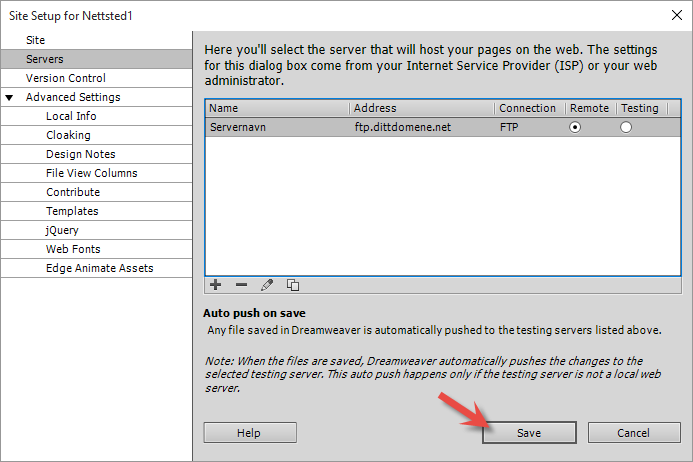 This guide explains how to set up an FTP account in Adobe Dreamweaver CC. We assume that you have installed Adobe Dreamweaver CC on your PC, and that you have not yet set up any accounts. You can read more about Adobe Dreamweaver here. Select "Site -> New Site" from the menu bar. 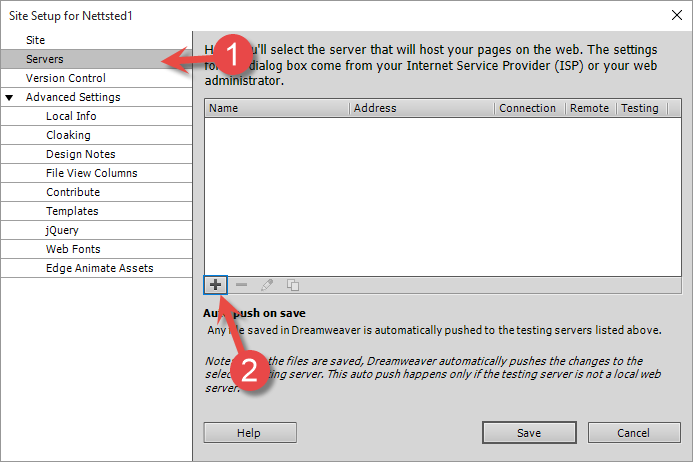 A new configuration window will appear for you to add a new FTP account to Adobe Dreamweaver. Check that "Site" is selected. Enter a name for the FTP account you wish to create in the "Site Name" field. In this example, we entered "Nettsted1". Specify the folder where you wish to store the files for this website locally on your PC in the "Local Site Folder" field. Select "Servers" from the menu. Click on the + sign to add the server setup. Adobe Dreamweaver needs information to connect to the FTP account where the website will be published. Enter a name for the server. The name is optional. Select "FTP" in the "Connect using" field. Enter the address for the FTP account you wish to connect to. 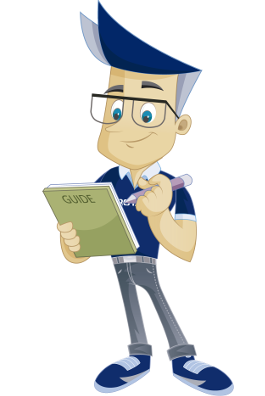 You should have received this information by email when ordering your web hosting solution with us. 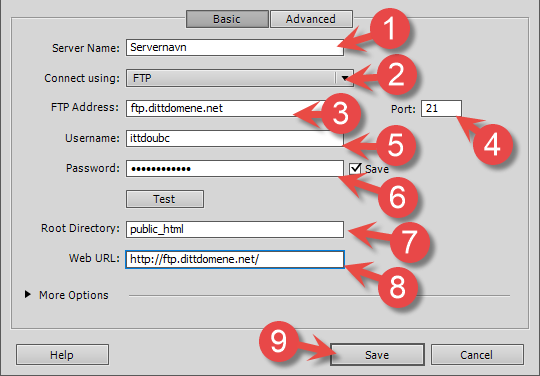 On our servers, the address will always be "ftp.dittdomene.net", where "dittdomene.net" must be exchanged with your domain. If your domain is not yet registered/transferred to us, you can use a temporary address, cpanelX.proisp.no, where X is the number of the server where your FTP account with us is located. Check that the port is set to be 21. Enter the user name. You should have received this information by email when ordering your web hosting solution with us. Enter the password. You should have received this information by email when ordering your web hosting solution with us. Enter "public_html" for "Root Directory". Root directory determines in which folder on the server Adobe Dreamweaver will start. This is the folder where all of the .html and .php files and the like should be uploaded. On our servers, this will always be the /public_html/ folder. Enter the URL of the website in the "Web URL" field. In this example, we entered http://www.dittdomene.net. 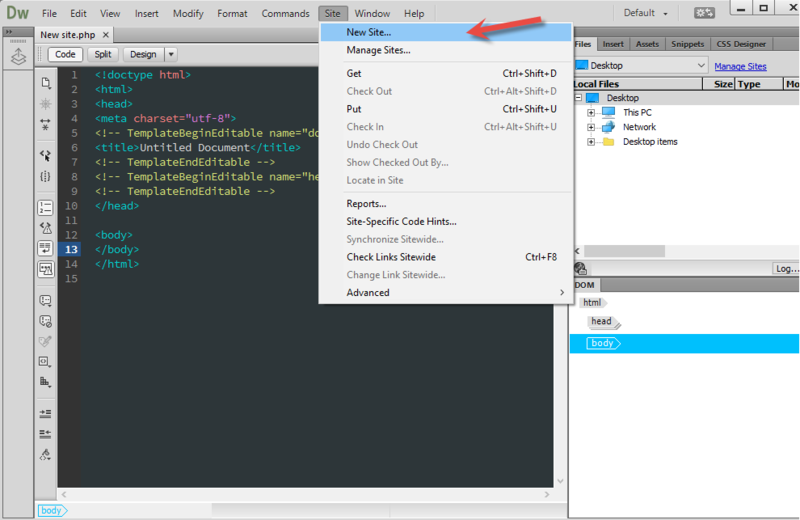 Click on the "Save" button to save the settings in Adobe Dreamweaver. Adobe Dreamweaver is now ready to connect to the account via FTP. Check that the "Files" tab is selected. Click on the "Connect to Remote host" button as shown in the screenshot below. Adobe Dreamweaver will now connect to the FTP account. 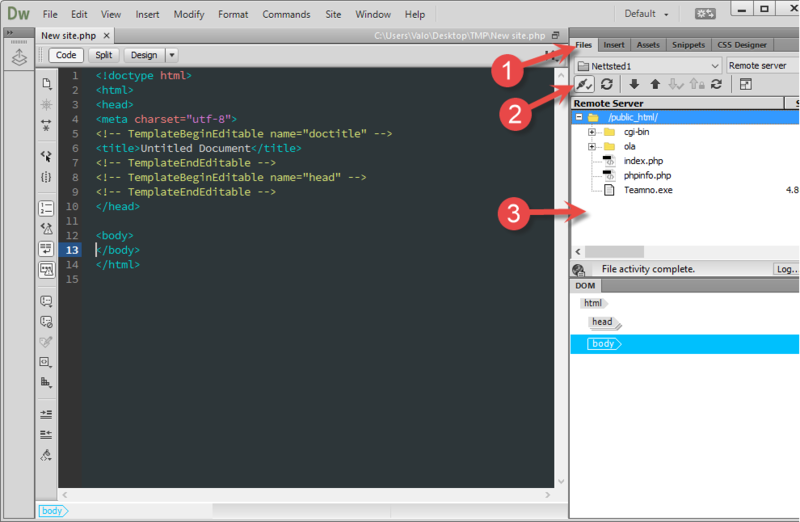 You will now see the contents of the /public_html folder on the server. 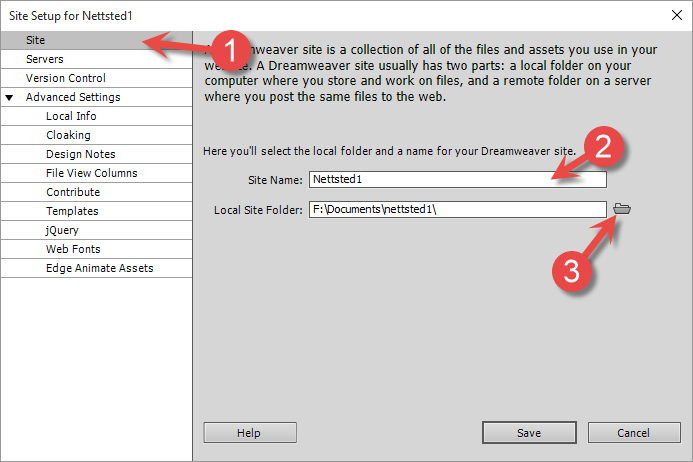 We have now covered the steps required for setting up an FTP account in Adobe Dreamweaver CC.